Rhoi is a comprehensive collection of work tables. The central goal throughout development was to create an approachable table using familiar archetypes with an elegance at a human scale. This informed the proportions and detailing of all elements with a view to making the table highly functional and effortless in use. Rhoi means “to give” and that is the essence of the table. The metal apron assembly simultaneously supports a wide array of top materials and does so while spanning up to ten feet without an intermediate leg. This opens the material palette to a very broad population top material densities, including stone, quartz, glass, Fenix®NTM, solid surface materials and world’s finest hardwood veneers. The Rhoi Table aims at once to be familiar in format and distinct in detail and execution. Soft corners and planes on the top, legs and structural apron all align to create a balance that defines the table as a whole. 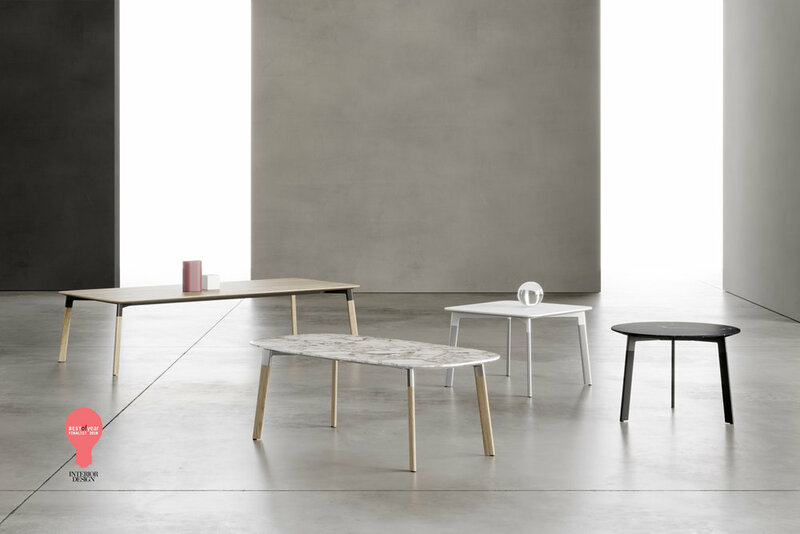 These elements express and support the structure of the table and the proportion and position of the leg define a character of elegance and approachability. The integration of metal framework to a variety of integrated leg material types supports a wide range of top materials without deflection and with increased span between legs. Table sizes range from a 42-inch round, square or triad, to a 240-inch two section boardroom table. A complete offering, with infinite flexibility. “Rhoi’s metal sub-top, the apron area, supports these heavier materials in open spans while being a pleasing form unto itself. It’s very nicely done. This is where Fig40 shows their ability to design, engineer and bring a concept to production-ready. That’s industrial design.” Bernie Tuohy.